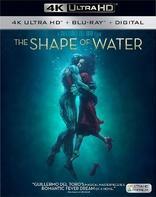 The Shape of Water, Guillermo del Toro's tribute and reconstruction of classic film and monster movies, arrives on 4K Ultra HD Blu-ray after deserved Oscar fanfare and critical acclaim. As the Best Picture-winning film for 2017, it splashes onto 4K in terrific order. This beautiful modern adult fairytale offers a terrific deconstruction of the traditional monster creature feature and instead casts it into the realm of an unlikely romance. With fantastic performances throughout, the film is an absolute joy. This 4K UHD disc offers up a strong A/V presentation that benefits from some resolution breathing room and its HDR10 enhancements. Highly Recommended. "Tragedy and delight, hand in hand." I love a good creature movie - especially the nontraditional ones that only a genre master like Guillermo del Toro can deliver. From films like Pan's Labyrinth to Hellboy to The Devil's Backbone, del Toro regularly explores the nature of monsters as living, feeling creatures and not simply the embodiment of fear and hatred that they are routinely cast as. With The Shape of Water, del Toro is given his fullest opportunity to plumb the depths of humanity and our quirky relationships with love and fear and how our need for one can allow us to slip into the darkness of the other. Less a monster movie and more of a fairytale romance, the film may not quite be del Toro's masterpiece, but it is a grand achievement giving audiences a heartfelt cinematic journey - if you can align yourself with the film's numerous eccentricities. Elisa (Sally Hawkins) lives a quiet unassuming life of routine. Wake up, make some eggs, tend to her needs, make her painter neighbor Giles (Richard Jenkins) something to eat, go to work at a government research facility and listen to her exuberant co-worker Zelda (Octavia Spencer) talk about her husband while complaining about the pee stains in the men's bathroom. Mute and able to communicate through sign language, Elisa may be of few words but lives a life of rich emotion and a longing for love - just like every other human around her. When she and Zelda are assigned to clean a top-secret research room housing a rare Amphibian Man (Doug Jones) captured in the Amazon, Elisa makes the unlikeliest of human connections with a creature that is decidedly not human. Her growing sense of joy and love is threatened by the barbarous actions of the facility's security head Strickland (Michael Shannon). With the help of a quiet and inquisitive scientist called Hoffstetler (Michael Stuhlbarg), Elisa concocts a scheme to bring her friends together to save the Amphibian Man from an unfortunate fate. I'm grateful that I was able to see The Shape of Water in theaters long before its Award Season run. When a film gets tossed into that pile of "Best Picture" contenders it gets saddled with the extra weight and perception of "being the best of the best." When an audience goes into any film with heightened expectations, it makes it even more difficult for the film to earn the careful and due consideration it is entitled to. Was The Shape of Water actually better than Three Billboards, Lady Bird, Dunkirk, Get Out, Call Me By Your Name, or Darkest Hour? Making those hardline distinctions of "best" or "better than" casts a film in a different light that I don't like to view it under. For myself, I rarely can pin down a "best film of the year," but I do enjoy numerous favorites. The Shape of Water absolutely was one of my favorite films of 2017 and was fully deserving of the acclaim and recognition it earned. I loved that this film, at its core, is a deconstruction of the classic monster movie mythos where the creature in question would often be a being of fear and murderous intent. I've never been fully able to align my thinking that way as there is a great amount of empathy to be given the creature. As this film pulls a lot of obvious inspiration from The Creature From The Black Lagoon and more specifically its sequel Revenge of the Creature, we're given a being that, by all constipated terminology, would be classified as a monster, but it's also given a true heart in the form of Sally Hawkins' Elisa. Both are beings out of place and time with the world around them making their connection unexpected but welcome and relatable. While Elisa does have friends who care about her, she doesn't experience true love and respect until the Amphibian Man rises out of the water and the pair shares a hard boiled egg together. It's pretty wild to see where del Toro decided to take the material considering the marketplace and the undoubted pressure to make the film a more marketable PG-13. While there is a lovable sense of whimsy to the film the characters' respective journies - it is decidedly not a kid-friendly feature, and all the better for it. I would be remiss to discuss The Shape of Water in too much detail as there are a number of plot points and important themes at play I would rather not color anyone's expectations further. Michael Shannon's Strickland is a particularly tough character to discuss without A: spoiling key events and B: coloring the film with any personal biases. The film has already been saddled with the weight of being "Best Picture of the Year," the film doesn't need my takeaways to burden it further. I want people to be able to glean their own intersections without me drawing the roadmap. Suffice to say I liked where it went with the material. I liked how each character arguably is in the search for love and connection. They each have their own ways of trying to make these connections and they all succeed and fail in their own ways. Would I call The Shape of Water Guillermo del Toro's crowning achievement? No, probably not. Similarly to how Scorsese nabbed his Best Director Oscar for The Departed, I would say that it is a deserving win for del Toro, but not necessarily for his best film. I often find myself split between The Devil's Backbone and Pan's Labyrinth for that honor. Still, it's an accolade that has been a long time coming for the man who celebrates monsters and the beauty they bring cinema. With Doug Jones delivering yet another terrific unrecognizable creature performance alongside an impressive leading turn from Sally Hawkins, The Shape of Water is a terrific achievement for a director and storyteller far from finished saying everything he has to say on movie screens. The Shape of Water arrives on 4K UHD Blu-ray courtesy of 20th Century Fox in a two-disc 4K UHD + Blu-ray + Digital set. pressed onto a BD-66 disc, the discs are housed in an eco-friendly UHD case with identical slipcover artwork. The disc loads to an animated main menu with traditional navigation options. None of the bonus features appear on the UHD disc and are accessible only on the included Blu-ray. The Digital copy of the film can be redeemed through Movies Anywhere, but only unlocks at HDX through Vudu or Fandango. I don't have a 4K Apple TV setup so I don't know if 4K is included there or not. The Shape of Water swims onto 4K Ultra HD Blu-ray in terrific form. Captured at 3.4k and finished on a 2K DI, upticks in details aren't immediately apparent as the SDR Blu-ray is already very impressive, but after doing a quick series of disc swaps and side by side comparisons, the differences do start to become more apparent. It's the finest of the fine features that really take shape in this upscaled 2160p transfer, small facial features, tiny stitches in clothing start to come to life. The detailing of Elisa's couch, the cracks in the tiling of her bathroom, and the small intricate features of the Amphibian Man gain a lot of extra visual traction. It may not be a huge leap and bound difference in that department, but it's appreciable none the less. The big improvement here is the smartly applied HDR10 grading. The wider color gamut allows for a more intricate color variation in the image. For example, when Elisa is sitting at the bus stop next to the man with the birthday cake, there is a neon green light bathing one side of her face. On the standard Blu-ray that light looked much thicker and uniform green, with HDR in play, the green has shades that highlight and conform to Sally Hawkins' face. Equally, any time we get a good clear look at the Amphibian Man, you start to be able to see the color variances between green/black base, the blue streaks, the and the gold/yellow flecks that make up its skin pigmentation. Additionally, when the creature's skin lights up the bright blue "stars" peppered over its body offer a more bold and pronounced presence. Added to that, the better black and contrast balance allow for some scenes to really pop and come to life with a great amount of depth. The various underwater sequences felt more vivid while the film's impressive black and white dream sequence is a real stand out. The white shirts of the various facility workers also offer a bolder presence and stand out against primaries. The scene when Michael Shanon's Richard Strickland is bleeding on his white work shirt is a prime example. The bits of slight video noise I'd noticed in the Blu-ray transfer doesn't appear to have carried over here. Given its base source limitations, this is a damned impressive looking transfer. It may not stand out as the cream of the crop the format can offer, but 4K fans should be more than happy. The Shape of Water arrives with a strong DTS-HD MA 5.1 audio track. While I admittedly would have loved something of a more atmospherically rich experience provided by a DTS:X or Atmos mix, this 5.1 track is no slouch where it counts most. Without one of del Toro's signature excellent audio commentaries, I was a bit worried about this bonus feature package. Thankfully, Fox went all out in every other department. While I still would have loved for del Toro to have recorded a commentary, I understand his reasonings after seeing this assortment of detailed and encompassing extras. If I have a true criticism of this bonus feature package is that I would have liked more. There already is a lot here, but I can bet there is hours worth of additional bonus production footage out there waiting for some new Special Edition or possibly even a Criterion Collection offering. None of the bonus features are on the 4K UHD disc. A Fairytale for Troubled Times (HD 28:55) While there are segments of this multi-part feature that stretch the trail of a traditional EPK talking-head piece, there is a lot of story territory where they get to dig into some depth behind the inspiration for the film. I really enjoyed the creature craft segment as they did an incredible amount of practical effects to bring Doug Jones' Amphibian Man to life. NOTE: These bonus features are very spoiler-heavy so don't watch until you've seen the film. Anatomy of a Scene: Prologue (HD 3:14) This is a short but a great look at the creation of the dream-like introduction that sets up key elements and scenes for the rest of the film. Anatomy of a Scene: The Dance (HD 4:50) This is a pretty cool behind the scenes look at the creation of the dream sequence. Shaping the Waves: A Conversation with James Jean (HD 5:05) This is a brief but very cool look at the artist's work and his work on the film creating the poster and other pieces. Guillermo del Toro's Master Class (HD 13:27) This is a very cool Q and A, but I honestly wish it was longer as the audience questions aren't really explored. Still very informative and well worth watching. Trailers (HD 6:55) Includes the Theatrical Trailer as well as both Red Band Trailers. While even under the best of circumstances it would be difficult for me to hail any film as the definitive "Best Picture of the Year," The Shape of Water certainly was one of my favorites. As a lover of classic monster films, I appreciated Guillermo del Toro's whimsical and heartfelt spin into the tricky realms of human connection and attraction. While I'm sure it's not a film for everyone, it's one I hope most folks give a chance. 20th Century Fox brings The Shape of Water to 4K Ultra HD in great form. The imagery bathes in the beauty of improved resolution but the wider color gamut afforded by a smartly applied HDR10 pass brings the color and imagery of the film to vivid life. While the audio mix may still be the same DTS-HD MA 5.1 track as the Blu-ray, the film still sounds amazing and the included Blu-ray disc includes all of the insightful bonus features. Highly Recommended.